I’ve been reading a lot about sketching landscapes lately and one idea that pops up regularly is that of assembling a scene based upon what you see and what makes the composition work. Moving a tree, or eliminating some is often the example given. I have a hard time with that concept. It makes perfect sense and I admire those who can do it, but it seems I’m a literalist at heart and so I always end up drawing what I see. But recently I did assemble a scene from nature, quite literally. During our trip to Rimouski we (mostly Chantal and Jodie because I couldn’t climb around on the rocks very well) collected a whole bunch of crab parts. The whole endeavour was done so I could draw the parts but it got a bit out of control. In the end, we ended up with a whole bag of smelly carapaces, legs and claws. When we got home the question was what to do with them as they really did smell. Chantal put all the parts in a bunch of pie tins with mesh cloth over them to keep the flies away and put them on our deck. The smell did diminish but it never went away, even after a week or so of loving care. So one day I decided that I would pick through them, find good examples and then take photos of them so we could throw everything away. As I started doing this the biologist in me, or maybe the Dr. Frankenstein, started sticking parts together. Before I knew it I had a nearly complete crab sitting on the table. I did take some photos of my prize and then sat down to draw it. 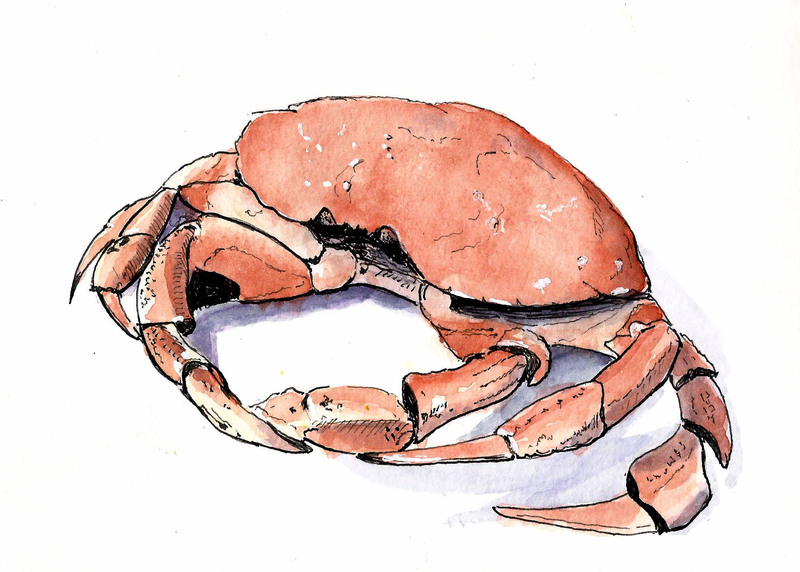 I learned that drawing a crab can make you go cross-eyed trying to follow all the leg parts but it was fun. Sort of (grin). 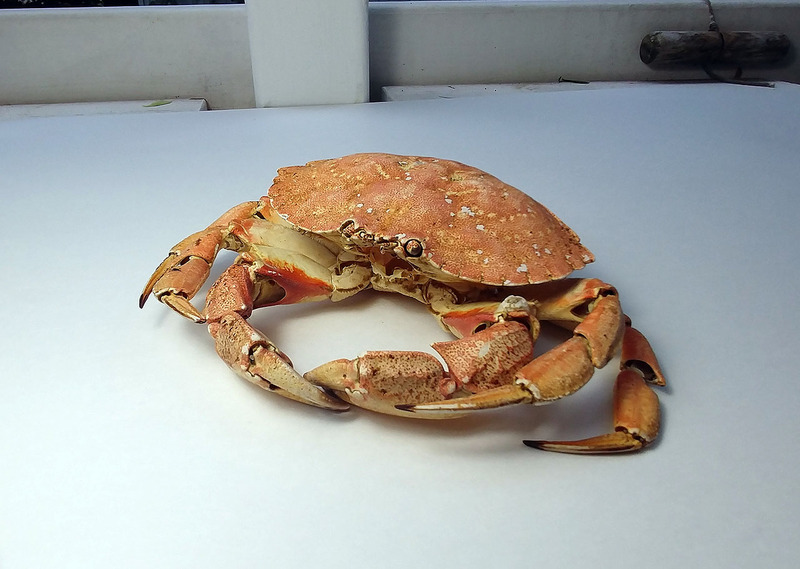 I think all the pieces came from a rock crab but I’m not a crustacean taxonomist.